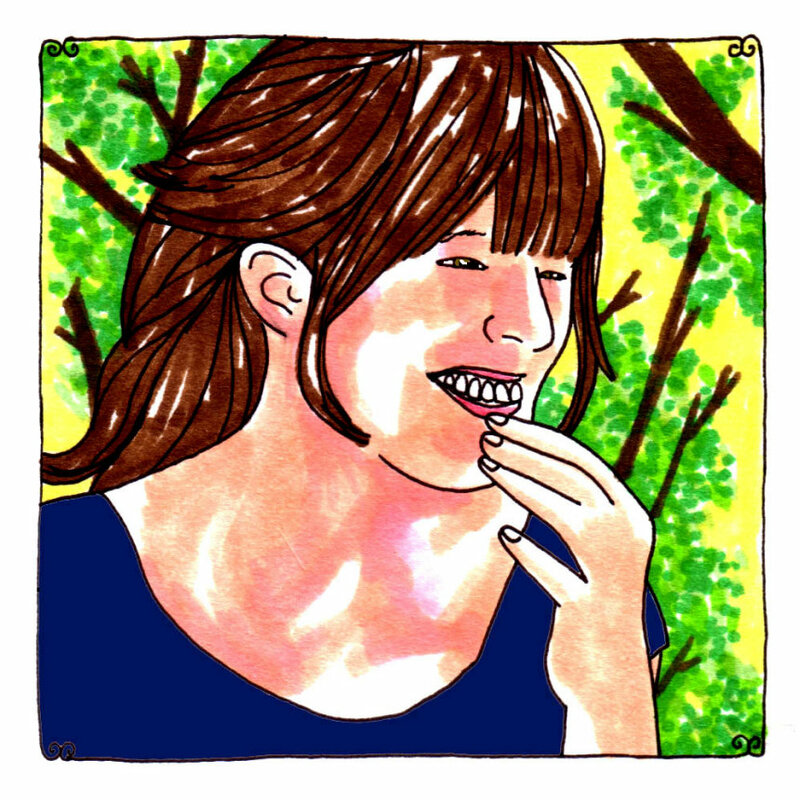 Julie Doiron lets her heart do the talking fairly often. It's a heart that's directly connected to her tired eyes, to her friendly mouth, to her kind body language and to her less romantic senses - the ones that take in that impulse to dial up an old friend that she hasn't spoken to in months or longer or the ones that tell her that talking at this moment isn't the best thing that she could do. Her heart shares more with all of these parts than just a blood relation. It goes to them for constant updates, for information about what's going on in all of the other reactionary ports, all of the places that can send distress signals when they overheat or are getting worn out. Her heart is made out of calloused fingertips and palms, just as it's made out of gray and sunny skies, comfortable beds, beds of nails, sleeplessness, shaking heads, shrugs, sighs and above all the kind of wondrous appreciation for the very basic things that we'll all find ourselves doing daily. It's a very specific type of love - the kind that you get lost in and never find your way out of. It's a complete love that lives vicariously through itself, if that's possible, just looking and looking at many things that it feels and does and then allowing it all to spill out as someone else's love, the gift of a storyteller. These basic daily things that make up Doiron's heart include having to survive when there's no guarantee that anyone has a chance at that. These include dealing with the many people who might feel as if they're consoling a freshly single friend by expressing their utter shock and disbelief in the breakup and saying that "everyone" thought that they were perfect together and that there couldn't be a way that it would go bad. These include the incessant daydreaming that might get done about other friends or family members, just thinking frequently, "What could they be up to right now?" and then tumbling into any kind of fictional plot twist, thoughts of their boredom or excitement in various shades of colorfulness or despair. Doiron's latest record, "I Can Wonder What You Did With Your Day," is another installation of the sorts of important trivialities that she gets concerned with when she gets concerned during her days up north in Sacksville, New Brunswick - where she annually hosts a popular summer festival in the town of few stoplights and not many more taverns. From her descriptions, it's a place that gives her ample time to explore these hypothetical dalliances with the thoughts, concerns, hopes and fears of the "good people all around me," living the life of dreams - a sentiment that comes from the first song on the album. There are young songbirds chattering throughout the background as she sings so gracefully that simple thought that should set anyone at ease or lower their blood pressure a bunch. On "Spill Your Lungs," Doiron sings about spilling wine all over a town, for nothing, referring to a couple whose love is playful and young until it changes into something that's not even friendly, that wants nothing to do with either of them. She sings, "We could scream our lungs out in this town for nothin'" and later adds, "Maybe I should have mentioned I'm not built for this kind of loving." Most of her songs involve people who are constantly trying to find what they were built for and if it's not this, than what could it actually be? They find that the nights are good times to try and figure it all out during, drinking straight from the bottle and just wrestling, wrestling, wrestling, feeling as if they're getting somewhere even if it's more desolate than the spot that they started from.